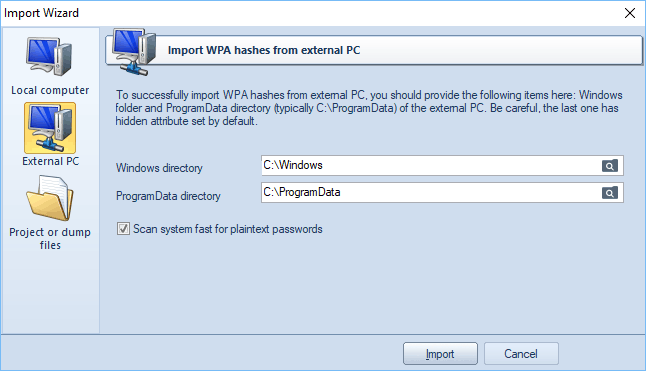 Wireless Password Recovery can read WPA-PSK hashes from an external computer. For example, from other operating system's hard drive. %WINDOWS%\System32\Config. The following registry files are processed here: SAM, SYSTEM, SECURITY, and SOFTWARE. The user profile for Master Key analysis. System account with system Master Keys. You can skip the system analysis and text password lookup by clearing the respective checkbox. This option does not require administrative privileges.